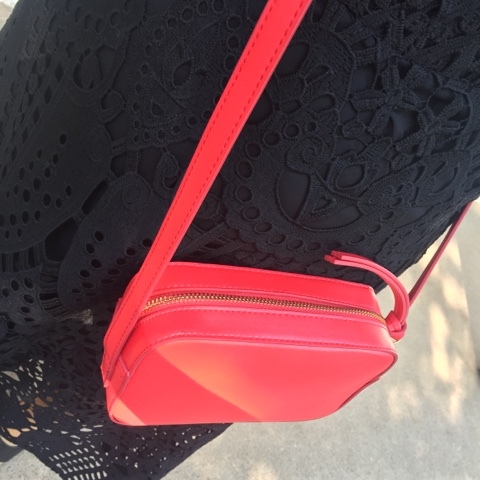 It's been so long since I blogged....fully blaming the amazing weather. No-one wants to be tied to the screens when the sun is shining like it has been for the past couple of weeks. So I'm easing myself in gently with a few outfits from the past 10 days or so - the ones that were worth photographing anyway. Starting with my new Next jeans. Now I've seen these all over Instagram and couldn't wait to try them. I have since realised that they come in a darker wash as well as the bright blue I got. I'm kind of gutted as I think I'd prefer the darker one but maybe this colour is better for wearing this time of year? 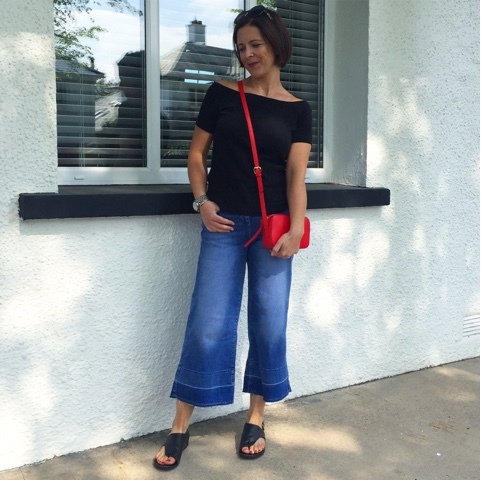 And the red handbag & sandals strike again a week later in this outfit worn to a couple of blogger events in Belfast. It was so lovely this week to get out to a few things and feel normal for a while. The pain is still there and I'm not great first thing in the morning but by about 11, I'm good to go! The dress in this next photo was one I got in the Warehouse sale way back in January. 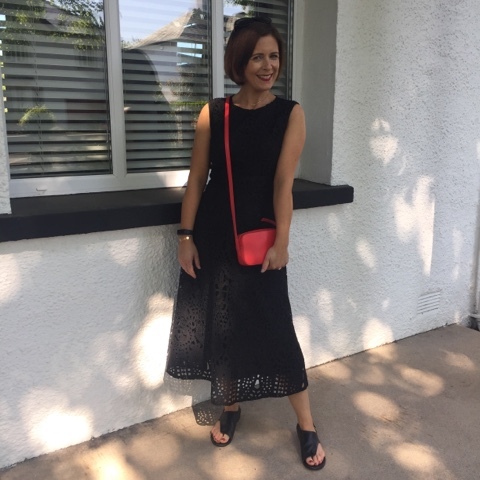 It's a gorgeous open lace material overlaid on a plain cotton underskirt/lining and I've worn it with trainers, boots, heels and now sandals to a range of events. It did have openwork sleeves to the elbow but I thought it made it look a bit frumpy so I cut them off. 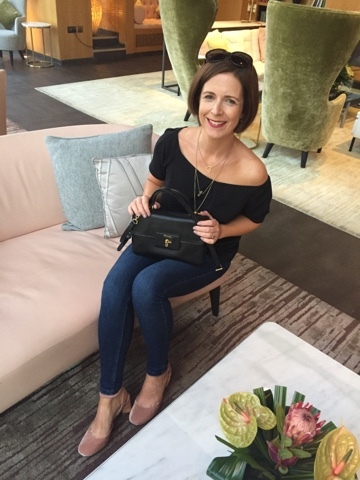 Another blogging event outfit this time - from an evening spent in the company of the Beauty PR team from House of Fraser at the Fitzwilliam Hotel. I was feeling brave footwear wise, so I wore my new velvet Office shoes that I showed you on this post (where there are more close up photos). I absolutely love them and was able to manage in them all evening. They, along with my (4th child) Prada handbag, felt like the stars of the show so I kept the rest of the outfit very simple with just some gold layered necklaces to pick up the gold in the bag and on the heels of the shoes. And finishing with one of the less stylish photos of the week but the one I'm most proud of. My son was off school on Friday and encouraged me to hike up Cavehill with him. 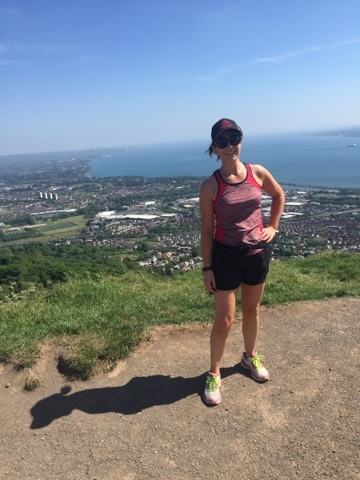 It's not a mountain but it's big hill and a steep 30/40 minute climb (if you take the route we usually take) and I honestly wasn't sure I could do it but the sun was splitting the stones and it felt like the most perfect day to give it a go. And I did it! I was so emotional at the top...couldn't believe I'd done it after so many weeks where I thought I was a broken women. I'm leaving the running aside for the time being but my sports therapist says I can start back at the gym this week (very slowly) and I've a plan of action to up my flexibility - one of the reasons my back gave up the goat again. I'm going to blog about the rehabilitation when I am sure that it's progressing well and actually working - it's something that lots of you have asked me about in recent days. I can't be sure that what I do will prevent future acute episodes like I just had (my 3rd in 8 years) but I'm confident that the strength work I've been doing over the past couple of years played a big part in my (relatively) quick recovery. What I'd not been doing since my last episode was flexibility work - something I kept meaning to do but never prioritised. It's top of the list now and I've already started using some youtube videos daily to improve my hip/hamstring and back flexibility. I don't have the budget to hand to join a yoga class and anyway, I am already out at the gym 3 times per week so I want to find something that I can do from home. I'll be posting my first monthly update in a couple of weeks and keep the messages and comments coming. I've heard from lots of you in recent weeks - some in awful pain right now, others who have rehabilitated, others again who are awaiting surgery or post-surgery. Disc injury and referred sciatica seems to be impacting so many people. I know that everyone's situation is different but using the hints and tips you've given me, along with the advice I've been scouring the internet for and the conversations I've had with some doctor friends, I'm hoping to find an inexpensive way to self manage and prevent this pain becoming a chronic issue. Ok - that's as deep as it gets! I'll be back talking beauty very soon....brows to be exact. Look up Yoga with Adriene on YouTube- zillions of routines long and short to do at home for free! Great thanks! that's really useful! I'm a teeny weeny bit taller, but usually take a 30-32 inch leg, but I would like them to look like cropped jeans rather than full length flared jeans! So I think I will go for regular also!